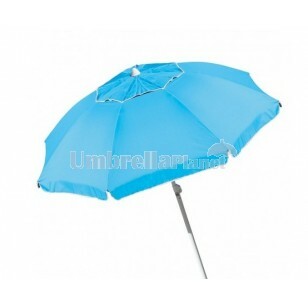 The Outdoor Vented Beach Umbrella provides sun protection for avid beach goers and is great for a day at the beach. This beach umbrella has all the qualities needed. Equipped with an aluminium 2 piece pole, height adjustable for the sun, fibre glass, deep fluted spike with twist handle etc. This umbrella also has a vent, allowing wind to escape from the top of the umbrella and keeps it stable in high winds. It comes with an attractable colour carry bag. The Outdoor Vented Beach Umbrella also has an easily adjustable height which ensures maximum shade and protection from the sun. For corporate beach events and picnics, this The Outdoor Vented Beach Umbrella is also good as a promotional tool to capture a wide audience. Umbrellas make fantastic marketing items because they have a long lifespan and proudly show your customisation to the world every time they're used. Our listed pricing includes one panel printing of your logo in one solid colour. A print setup cost of $75 applies per colour/position. We can print in additional colours for a small charge, just let the friendly sales team know your requirements. Umbrella Planet is Australian owned and operated, so we can deliver umbrellas in two weeks to your East coast location. Regional and western areas please anticipate 3-5 days additional delivery time. We service all states and territories including NSW, ACT, VIC, QLD, SA, NT, WA, and TAS.